Looking to fly south this winter? Here are five sun-filled destinations flying out of Comox Airport that may interest you into getting away from the cold for a spell, guaranteed to give you a dose of Vitamin D - straight from the source! Located in Banderas Bay, one of the largest bays in the world on the Pacific Coast of Mexico, Puerto Vallarta is a resort city known for its beaches, water sports, restaurants and nightlife. Starting off as a silver mining village in the 19th century, and then a fishing town, it became a destination for national and Hollywood stars in the 1960s. From that point on, it ceased to be "a secret hide-away waiting to be discovered." Go there. It's sunny, warm and beautiful. A.K.A. 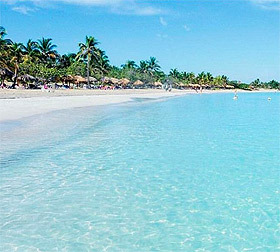 Playa Azul (Blue Beach), is a Cuban resort town located on a narrow 20-km long peninsula in the Caribbean. It's surrounded by white sandy beaches, has a nature reserve with virgin forests, as well as natural caves, and pristine cays - small sandy islands on the surface of coral reefs. There are also plenty of cultural and historical attractions nearby. Needless to say, it's sunny, warm and beautiful. Go there. There's always something happening day or night at the self-titled "Entertainment Capital of the World." Known for its casinos, luxury hotels, shows, shopping and fine dining, there's no shortage of activity in the "City That Never Sleeps." Interestingly enough, for those who like the outdoors, Red Rock National Conservation Area, located just outside the city, features red sandstone peaks and walls that tower over the desert floor that can be explored by car, bike, hike or by climbing. 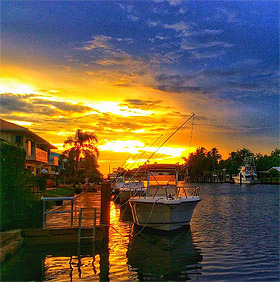 Beach days, fishing expeditions, exploring the natural beauty of the Everglades, and museum tours are just a small sample of things to do in this Florida resort city. Averaging 3,000 hours of sunshine per year, there aren't many days you can't spend outside. In addition, the Miami is less than 40 kms south of Ft. Lauderdale and can be accessed easily by car or bus for a day trip! These Five Awesome Sun Destinations from YQQ are just a few places you can fly to from the Comox Valley to catch some rays and get rid of the winter blues. Just make sure you bring plenty of sunscreen and spare batteries for your camera because these five hot spots are sure to be packed with lots of photo opportunities and plenty of sunshine!